Comforting casserole for a chilly evening. Makes great leftovers. 1) Boil rigatoni a minute or two less than package directions call for; drain. 2) In large skillet, sauté onion about 5 minutes in olive oil. Add garlic and sauté a minute or two more. Add spices and stir. Add diced tomatoes and tomato puree and bring to a boil. Reduce heat and simmer on low about 10 minutes. 3) Mix together the rigatoni and the tomato sauce. 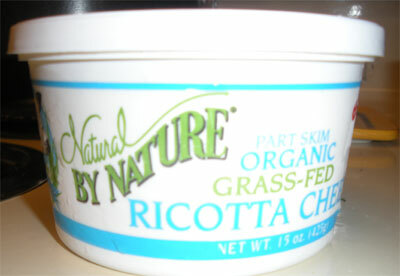 4) In medium sized bowl, mix together ricotta cheese, parsley and egg whites. 5) Grease large casserole dish with olive oil. Add ½ of the rigatoni/tomato sauce mixture, then layer ½ of the ricotta mixture. 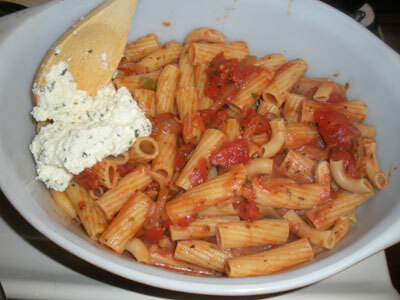 Add the second ½ of the rigatoni/tomato sauce mixture, then the second ½ of the ricotta. 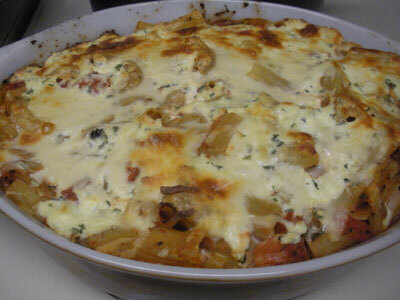 Top with ½ cup of shredded mozzarella. 6) Cover with aluminum foil and bake in 350 degree oven for 20 minutes. Remove foil and bake another 15-20 minutes.